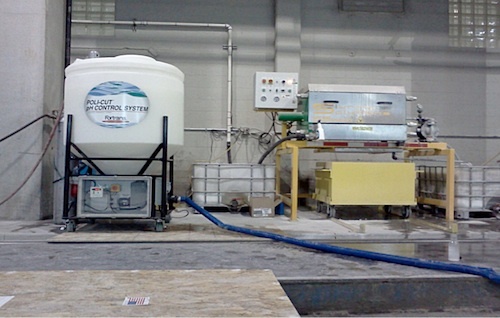 For over a decade now, Fortrans, Inc.® has been a trusted source for pH control systems, pH neutralization systems, and process water management systems for a wide range of applications, including concrete manufacturing facilities. We produce self-contained CO2 pH control, neutralization, and monitoring systems that use CO2 gas to neutralize high-pH process water and lower total suspended solids in process water produced at ready-mix and premix concrete plants. Our specialists and team members are dedicated to providing the highest quality pH neutralization and control systems and products and the finest customer support available in our industry today. When you place an order with Fortrans, Inc., you can trust we will be vigilant in matching you with the right products and pH control systems, and getting it to you as quickly, and as safely, as possible. Our staff is available to you even after you’ve made your purchase—your business is not just another feather in our cap, so to speak. From concrete-truck cleaners to CO2 pH control systems, Fortrans wants you to choose our company for all of your needs each and every time! The team at Fortrans is committed to going above and beyond in every aspect of our business. To experience the Fortrans difference yourself, contact our team today at 866-958-7267. If your facility or business is in the United States or Canada, we can work with you to provide the ultimate in eco-friendly, cost-effective CO2 pH control systems, pH neutralization systems, and products!